March 25th was the EU’s birthday. It was celebrated in London and elsewhere by anti-Brexit demonstrations. Initially organised by Unite for Europe, supported by European Movement and the 3 Million group of EU citizens living in the UK, there were some unhappy arguments about whether the London march should go ahead because of the terrible killings at Westminster three days before. When it appeared that people were going to turn up anyway, the European Movement grudgingly issued a statement saying people should attend, while the press enjoyed publishing pieces about ‘infighting’ in the anti-Brexit camp. Be that as it may, the police were happy for the march to go ahead and when I arrived in London, it was obviously business as usual. Policing was light, polite and friendly, and no, they weren’t all armed and wearing flak jackets, despite having to deal with a bigger demonstration than forecast. Of the total votes recorded, 52 per cent voted to Leave the EU, and 48 percent wanted to Remain. But – 28 percent of the total electorate did not even vote; which means that 37 per cent voted leave and 35 per cent voted Remain. That, say the Remainers, is rather more ‘underwhelming’, and as more information on the perils of Brexit are revealed, people are changing their minds. What has fuelled the anger is that the Prime Minister Theresa May is leading her team to a ‘hard Brexit’ result, absolutely regardless of what half of the UK wants. That half is simply not being listened to. Saturday’s demonstration was their chance to make their voices heard. The start of the march was delayed as far more people than expected were turning up. Many thousands came, much to the fury of the right-wing media which has been extolling the (very questionable) glories of a life outside the EU. The original estimates were for 16-25,000. One media tweet, surprised at the numbers, said, “I’ve been standing here for 10 minutes and they are still going past!” Actually, it took over 2 hours. The media then gave estimates of ‘between 25-100,000’. Can’t they tell the difference? One police estimate was, at one point, given as 50,000. It was certainly well over that, and maybe it did approach 100,000. Who knows? I joined the crowd waiting in Trafalgar Square for the march to arrive from its start in Park Lane. Straight away I was meeting fellow minds and instant friends. Everyone except me appeared to have come prepared with small and large EU flags and banners. At times it was like standing in a sea of blue and yellow. “Amazon must have made a fortune,” said the man I was talking to, implying everyone had ordered the flags on line. And he kindly gave me the flag he was holding, which I carried – all the way back home. What was obvious was that the whole event was a celebration of what Europe could and should be. From little babies to the very old, from large groups to people walking by themselves, citizens of the UK and from all other European countries were united. United in their determination to stop the ruination of their lives, and united most of all in their delight at being together, whatever their colour, their culture or nationality. From Trafalgar Square we marched down Whitehall to Parliament Square where the march would end and the speeches begin. I’d had my doubts some days before as to whether Parliament Square would be big enough. I was right. At one point along Whitehall a loudspeaker was belting out John Lennon singing ‘All you need is love’ while the marchers sang along. One woman was playing the EU anthem, Beethoven’s Ode to Joy, on her clarinet as she walked. People chanted and cheered – and stopped outside Downing Street for the obligatory boo at the Prime Minister’s residence. The joy and happiness of being with each other was palpable. We were being fed on the strength of being together. It seemed possible, after all the depression and despair felt by so many, that somehow we really could stop Theresa May’s incompetent government from wrecking our British and European lives. Parliament Square rapidly filled up and the speeches began. Police directed marchers to other areas around the Square. But more kept coming and marshals had to tell people that no more could enter the Square, because it was so crowded. The speeches ended, but still they were marching down Whitehall. Walking back towards Trafalgar Square, I wondered when I would find the end of the march. All I could ever see were more waving EU flags turning into Whitehall, and more placards to appreciate and photograph. 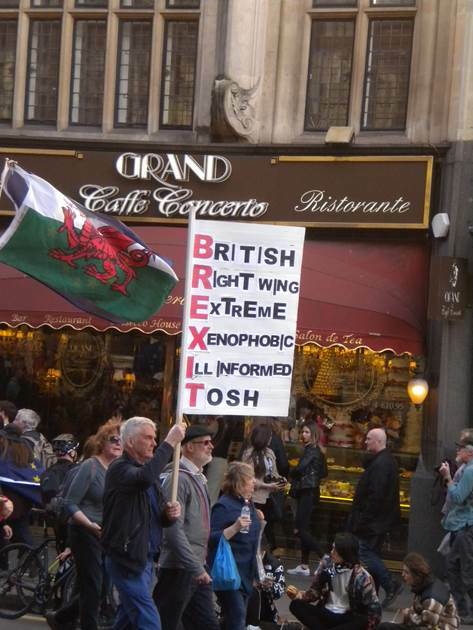 The placards were a joy. Most were handmade, in turns angry and funny, rude, despairing and clever. Mrs. May – when you trigger Article 50 on Wednesday, spare a thought for the sea of blue and yellow flags outside Parliament. The half of the United Kingdom that voted to stay with Europe, and the 3 million Europeans who live and work here aren’t going away, they won’t be silenced, and after Saturday’s demonstration are more united than ever in their anger and determination to stop your government from wrecking this country and their lives. And Mr Corbyn – isn’t it time you acted as a real Leader of the Opposition and spoke up for all those people who didn’t vote to leave? That includes the many thousands who, like me, joined the Labour Party because of your socialist policies, and who are looking to you to fight for the rights and protections we have because of being part of the EU. Can you point out exactly where Mr Corbyn has not spoken up for the rights of us remaining?